I have just come in from a hike in my “back yard” on a trail that skirts 3000 acres of open space. There is a clear flow of energy all the way from China across the vast Pacific to this beautiful spot I am privileged to call my home land. I placed 3 rocks in my prayer tree, one for the Pilgrimages to Avalon and Chartres in May, one for increased attention to writing and music, and one for the September Pilgrimages to Wales, Iona and the Callanish Stones. These days between the holidays have become a bastion of being for me, out of the regular schedule, without the need to accomplish. They are a chance for rest, rejuvenation, movies and seeing old friends. I can feel the usual rhythm beckoning as of Wednesday, so right now is the chance to cast my dreaming net into the ocean of 2019. The pilgrimage to the Callanish Stones planned for September 11-14 is what ignites my imagination most fully. When I visited last May, the call was clear to come back and bring like minded ones to stand where our long time ancestors once stood, attuning to the wisdom of the stones and using our modern imaginations to ask the questions that face us as a species in this time. We will go as pilgrims ready to discover and learn. One of the features of the location of the stones, is that like my home, they are in the path of energies that come all the way from Canada across the wild North Atlantic. I am fascinated by the flows of Gaia’s meridians and what we can learn as conscious ones attuning to their messages. 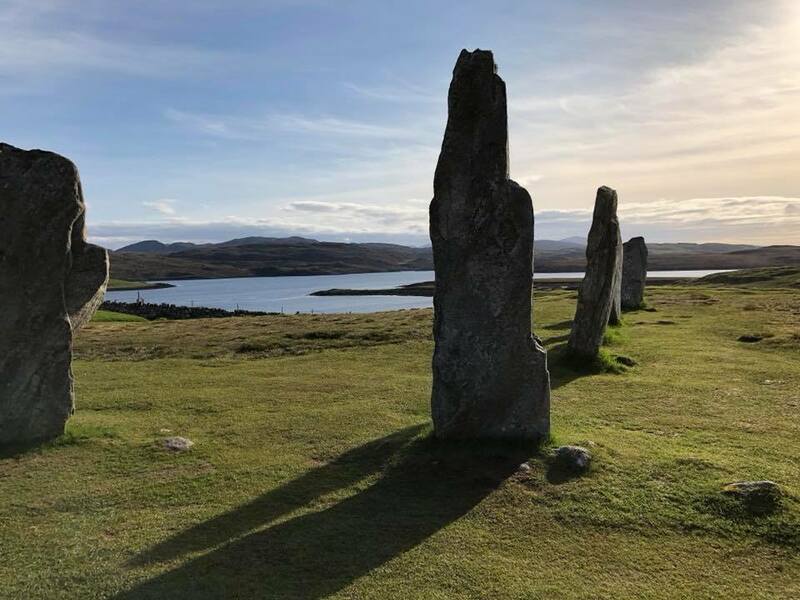 I am still welcoming 6 more pilgrims to Callanish. Iona is open for 7 more, and Avalon can receive 3 more pilgrims. My class, Meeting Mary in Chartres which includes a candlelit labyrinth walk is open for many. Check Circleway.com for more details. This entry was posted in Uncategorized and tagged pilgrimage on December 31, 2018 by Judith. I have been back just over two weeks from Australia. I have been noticing the brew my psyche is preparing of my experiences. 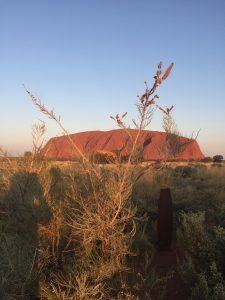 I worked with 60 pilgrims in the land of the soul over the course of 5 different workshops and and then I met Uluru and Kata Tjuta, the great stone beings of central Australia. I feel something new in me and I would have to say that there is another note in the chord of my life–subtle, grounded, quietly joyful. My friend Marg and I made the pilgrimage to the “Red .Centre” after the Melbourne Womens’ Dream Quest. We flew to the dusty town of Alice Springs and drove west out through the desert for 5 hours toward a simple resort 15 kilometers from the monuments. Vast desert landscape met us and few other vehicles. We saw just prickly desert plants, sun and blue sky. As we came nearer to the Uluru-Kata Tjuta National park, the landscape changed. There were more desert trees standing solitary witness and the atmosphere slowly became numinous. It seemed a fitting symbol of the journey I had made to come to this Center and an homage to the wandering Aboriginal people who used to roam this land also coming to this Center. Soon enough the light began to leave the sky and Uluru changed from a rather bright rusty red to deeper crimson. All visitors had to leave the park by 7:30 and so we humans made their way back to our accommodation in the resort. painted Kata Tjuta with the subtle tones of sunrise, the other tourists left and we were free to commune and be in silence. 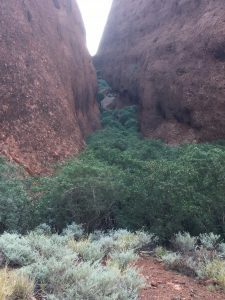 We next made our way toward Kata Tjuta and a hike into Walpa Gorge. We walked up the gully, wild wind blowing through the only aperture in the wide open desert. We encountered a lush river of green trees and shrubs nourished by an underground spring and protected from the harsh desert on all sides. The Anagu people, the traditional owners of this country came to this spot as a pilgrimage. Kata Tjuta is sacred to the Anagu men. It became clear to me that the shapes of the landscape and the fecundity of the gorge would remind any human of the sacred gifts of women. Perhaps Anagu men came here to learn. Next we circumambulated Uluru. I had brought a stone from Deer Heart labyrinth to leave as an offering. I found the place that called and sat for a while connecting the two places and the network of labyrinths all over the world. Everything about these places felt simple and primal. I could imagine our long time ancestors listening to the landscape, going about their lives in a harmony that we cannot imagine in the modern world. The harshness of the climate out here, the necessity of learning where and how to survive, the imaginal richness of the night sky and the parade of colors greeting the dawn and dusk all taught them how to be in right relation to Land and each other. When we left the next day, I grieved. I was touched to the core. 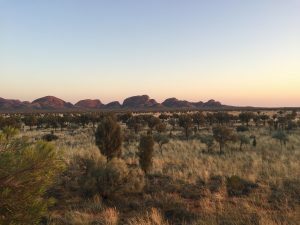 As we drove the 5 hours back to Alice Springs, there was a particular spot on the road where I felt the boundary of the pull of Uluru and Kata Tjuta. It is for good reason that this place is considered one of the chakra points of our planet. I felt gratitude for the attunement. Coming back to my work and meeting with the next circle in Alice Springs, I experienced an increase in my ability to hold Earth and more credibility to encourage others to feel our special human job of bridging Heaven and Earth while standing in love and awareness in the Circle. This entry was posted in Uncategorized on October 11, 2017 by Judith.